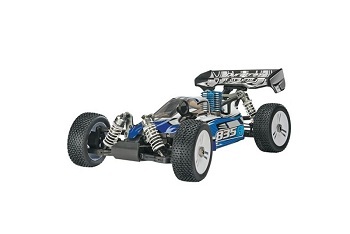 There are a lot of tough buggies, but only one that’s guaranteed tough — and that’s the new 1/8 scale Duratrax 835B. It’s loaded with Stress-Tech™ parts, and every one of them is protected by a 1-year replacement guarantee. If any Stress-Tech part fails during the first year, DuraTrax replaces it free. Other reasons for the 835’s durability include grey-anodized aluminum parts and hardened steel parts in the drivetrain. Driving the 835B is a SuperTigre® G-27CX .27 engine, a power, a power plant known for dependability and power, it’s protected by a 3-year limited warranty. The G-27CX .27 demands matching control and Duratrax provides it with a 2.4GHz FTR (Futaba Transmitter-Ready) system. It’s several steps above the usual ready-to-run radio, because it includes digital, metal-geared steering servo, 5-cell receiver pack and a wall charger. And since it’s an FTR system, it’s compatible with all Futaba® 2.4GHz FHSS systems. While it’s great for sport driving alone, the 835B’s power and radio system also make it a solid contender in venues all the way up to regional contests. Droop screws, hex head hardware and more offer track-tuning flexibility for the up-and-coming competitor all in one value-packed package. SuperTigre G-27CX .27 engine, with recoil starter, polished tuned pipe, glow plug and 3-year limited warranty. The 835B will be available early July. You know anywhere that I can buy a Duratrax 835B buggy? I have one if you have not found one yet.